Initially released in 1968 (and cellarable for decades), this once-retired barley wine is back and now being brewed by Meantime. This famous beer is back, thanks to two Italian brothers who have commissioned Meantime Brewing to do the honors. As befits a beer of 11.7%, this is full and warming, falling on the sweet side but never cloying and featuring sultanas, a hint of orange and suggestions of cherry/marzipan as it warms in the mouth. A smooth hop note adds a pleasant bitterness to the mellow finish, where a faint oak tang emerges. A rich fruitcake beer that tastes fresh and has a silky texture, tingles the gums with alcohol but never gets bogged down in esters. A class act. 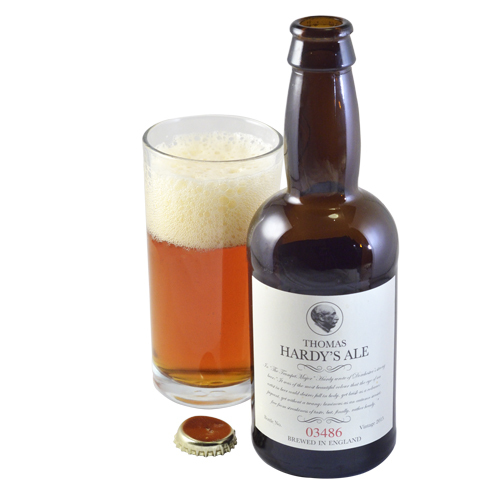 A big welcome back to this iconic, world-famous barley wine first brewed to commemorate the work of English writer Thomas Hardy. It’s brewed in London and has a chestnut color and superb aroma of sherry wine and vinous fruit, freshly peeled nuts, hints of butterscotch, pale chocolate and roasted grain. There’s a massive fruit hit on the palate with butterscotch, roasted grain and a light hint of spicy hops. The finish is bittersweet, bursting with fruit, roasted grain, toffee and gentle hops, and a lingering vinous note. It’s the claret of the beer world!